Established in 2015, we decided to address an issue that a lot of the members of the Ithaca community complained about. 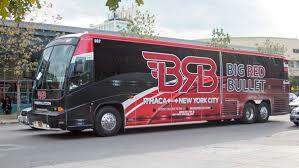 We provided safe reliable daily non stop transportation from Ithaca to NYC. The Big Red Bullet stop in Ithaca is located on Green Street, immediately in front of the Urban Outfitters store, and across the street from the Ithaca Commons.